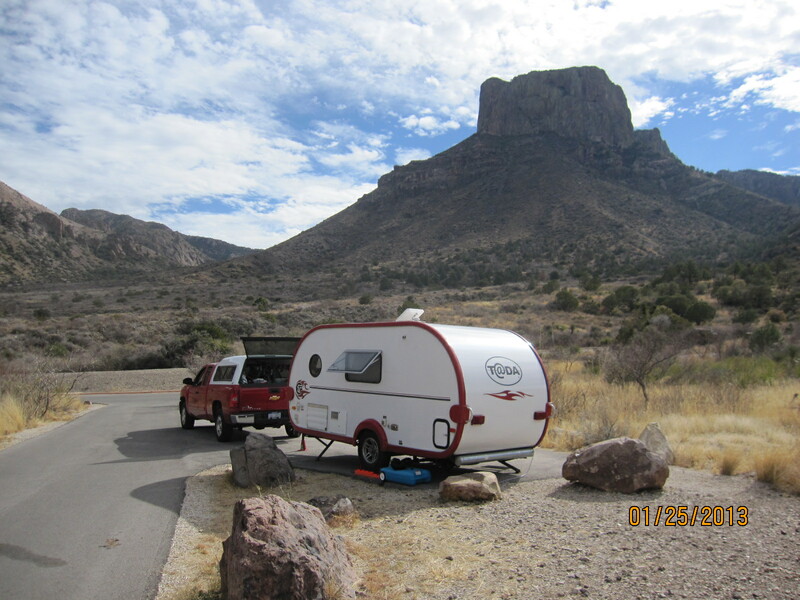 We’ve moved to a new campground at Big Bend National Park, after our first two days at Rio Grande Village. Our new home is at Chisos Basin, which is the highest elevation of the BB campgrounds, at around 5500 feet, the highest we’ve been with our little camper. It couldn’t be more beautiful up here. One little problem, though, as you may see from the photo is that our trailer license plate seems to be missing! No problem for the crafty John Crankshaw, though. Now at least we look semi-legal. We’ll deal with the Secretary of State office when we can get phone service again. nobody stole it. John’s system of using bailing wire, wax, and string failed him. Who the hell steals a license plate? Crazy. Hope everything else is going well. I donno….don’t look legal to me….